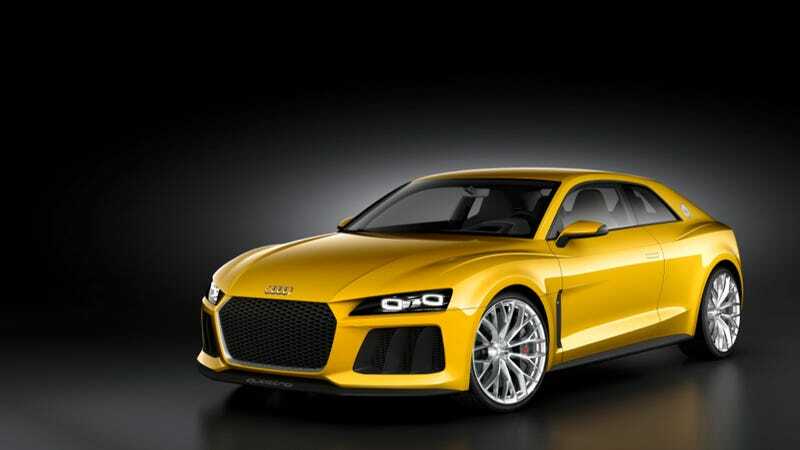 When I saw the concept drawing for the Audi Sport quattro, I was stoked. I thought it looked so aggressive and wild. But it was a concept drawing, and those always look outlandish. Here's the real thing, and it's not as aggressive as I hoped. I hate drawings. Ok, so the Sport quattro isn't ugly by any stretch of the imagination. But it just isn't what I was expecting. So what is it? It's a plug-in hybrid with 700 total horsepower and 590 pound feet of torque from batteries and Audi's lovely 4.0 liter turbo V8. It gets to 60 in 3.7 seconds. So that all sounds good. Here's the bad part: It weighs 4,079 pounds. That's really quite heavy, and explains why the 700 horses and mountains of torque don't equal an insane 0 to 60 time. We get to thank the hybrid tech for that weight. That's too bad. It doesn't look like it'll eat your children, but the weight makes it seem like it already did. But the more I look at it, the more I like it. The big wheels, the hatch, the subdued aggression. But there's still something a little off to me. I guess because I was expecting a wildly fender-flared monster, not a semi-production feasible sport coupe. I wanted to envision it running in Group B, not getting groceries. We'll see it in the flesh at the Frankfurt Show. Hopefully it doesn't eat us then.